Sandy Felton talks to Monique and Simon Gudgeon about their Dorset Sculpture Park and discovers why landscape and sculpture are such perfect partners. 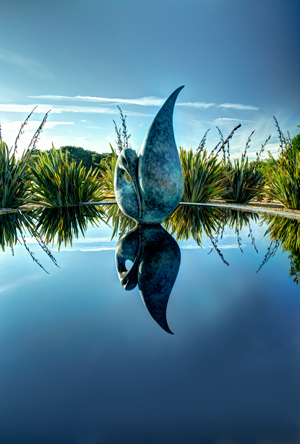 Nestled in 26 acres of Dorset’s beautiful countryside lies ‘Sculpture by the Lakes‘, a tranquil landscape that provides the perfect setting for the works of one of Britain’s leading contemporary sculptors. Simon Gudgeon has a signature-smooth style that concentrates spirit and nature. His minimalist, semi-abstract forms depict both movement and the emotion of a moment captured. 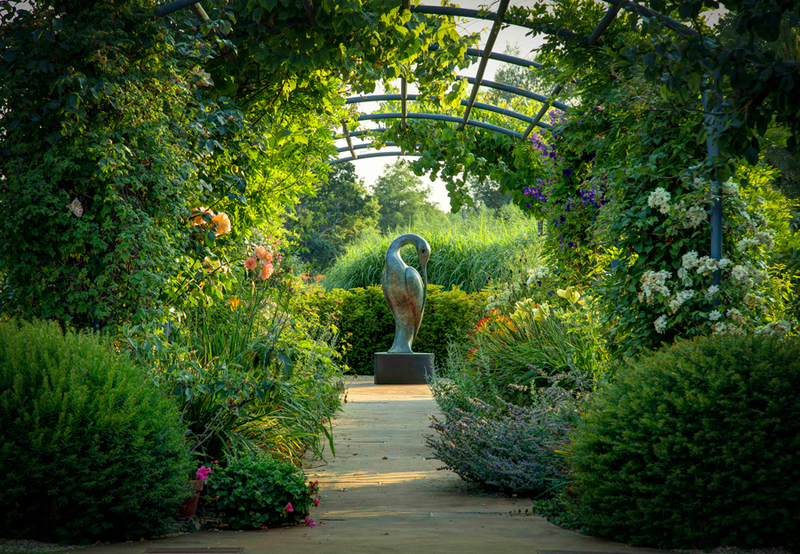 Being able to display his work in the beautiful surroundings that Simon’s wife Monique has created and designed at Sculpture by the Lakes, is both inspirational and uplifting. I first came across Simon’s work at the RHS Chelsea Flower Show a couple of years ago. I loved his work and jotted his name down on my list of ‘to contact’. I had no idea at the time that Simon and Monique had developed Sculpture by the Lakes or the story behind the creation of the Park. I was about to start on an interesting journey of discovery. Being a renowned sculptor is one thing but deciding to exhibit your work in a Sculpture Park is quite another. Monique explains that the decision to create the Park was not as obvious as most people think: “It was more of an organic process – living with the landscape for a while and then realizing what a unique location this would be for sculpture,” explains Monique. “It was also a practical decision as we had one of Simon’s large sculptures – Thoth – in storage and decided it would be better off with us at the Lakes rather than sitting in a warehouse.” After that first piece was in place the possibilities seemed obvious. Simon started to create work that was influenced by the landscape and setting and the rest, as they say, is history. Although Monique says that the challenges were not that great, the couple had to create the landscape and make sure that the sculptures were in the right place and the correct context. Monique is a former London PR turned landscape gardener, and she spent the following four years hauling earth and digging streams to create a landscape that worked for them. Monique and Simon had been to enough sculpture parks to know what they didn’t want – for them one of the most important lessons they learnt on their travels was how a sculpture works against buildings or planting. The landscape is determined by the art with the key being an appropriate planting plan that will enhance but not distract from the work. Monique only made one ‘proper’ plan for the Park when the couple moved to Pallington, several years ago. They had brought lots of plants from their previous garden so they had to plant quickly and in an organized design: “Since then we have never put anything down on paper,” explains Monique. “We’ve allowed the existing landscape and the sculptures to dictate what we did. If I had to describe my landscaping style, I would say modern Arcadia, using the natural landscape and working my plants into it without being too formal,” she adds. Rousham Park, near Oxford was significant for Monique – designed by William Kent in the 17th century, it has hardly changed since then, but as Monique points out you would not call it ‘old fashioned’. She thanks Monty Don for introducing her to Rousham and strongly recommends everyone to go and see it. She also greatly admires the Japanese style of gardening, its perfection and attention to detail and admits that it is quite mind boggling, which brings out her slight OCD tendencies! I’m always interested in why landscape and garden designers feel sculpture is important in a garden and for Monique it’s the drama and structure they add: “It also leads the eye down the garden and provides a focal point, but as well it’s something that is imbued with emotion and leads the viewer to consider the inspiration behind it and how it fits into the garden – it makes people think about what they are looking at,” she says. Asked what considerations need to be made when choosing a piece for the private garden, Monique has no hesitation in saying: “Do you love it? Does it make you think, does it inspire? Art should inspire emotional responses and whether that is the same as the artist intends is irrelevant, as long as the emotional connection is there,” she says. Clearly Simon and Monique work in harmony, (pictured together right) one complementing the other with regard to the Sculpture Park. So how does the process of deciding where to place a piece of work go and then how does Monique decide on the planting? “Simon is always working on a new piece and as soon as it begins to take shape we both start looking for the right spot in the Sculpture Park,” says Monique. “Sometimes that means moving another piece if the new one works better. It’s rarely an instant decision, it can sometimes take a few days till we are sure and even then it can change.” She explains that one piece, ‘Reflection’, has been in three different positions but now sits firmly in the Infinity Pool, which is at the end of the drive and seen by everyone as they arrive. With regard to planting, this is strong but subtle: “Adding a strong structural background but without being too distracting,” points out Monique. She achieves this by sticking to one variety such as Phormium tenax – a good dramatic plant to use for a lot of sculptures. “Bamboo adds a contextural backdrop to ‘The Bird of Happiness’; Armeria maritime – Thrift – is the perfect low level carpet to surround ‘Embrace’ as well as being planted in beds that reflect the shape of the piece,” Monique adds. Evergreens are also necessary to achieve the same effects in winter as in summer. For Monique green is important as is structure, but generally she admits to being influenced by a whole raft of garden styles and in common with most of us, getting lots of ideas from books, television and gardens she and Simon have visited. If you ask Simon if he has a favourite piece he will answer that generally it tends to be the piece he is currently working on: “If I had to choose one in particular, I would say ‘Search for Enlightenment'”, he says. “It has such a strong inspiration behind it and one that I continue to explore, this being the breadth of human experience in relation to the universe that surrounds us.” ‘Search for Enlightenment’ is about the narrowness of consciousness, the vastness of time and the transience of humanity: “Us humans have an overarching arrogance about our importance in the great scheme of things when in reality we are of such little consequence,” he adds. Simon sculpts primarily in bronze and occasionally in other mediums such as granite, glass or stainless steel. He has attained worldwide recognition with exhibits in major cities and venues including London, New York, Paris and the Netherlands and his works are featured in private collections both abroad and in the UK including those of HRH The Duke of Edinburgh. 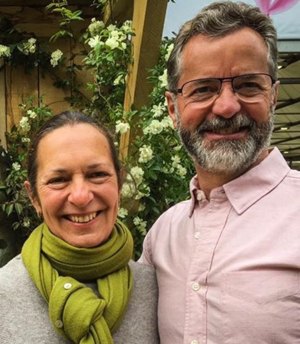 The couple’s Chelsea Flower Show Stand was awarded Five Stars at this year’s (2017) show, with Simon’s sculptures being integrated into a planting scheme by Monique. For RHS Chelsea 2018, Monique is keeping her cards close to her chest but did give a clue by saying that if they are accepted by the Royal Horticultural Society they might have a show garden, centered on the sculpture ‘Search for Enlightenment’. They will also have their usual trade stand on Main Avenue. The Park has a Gallery Café providing locally sourced and freshly produced seasonal dishes. The Sculpture Park can be found at Pallington, Dorchester, DT2 8QU. Please note that no children under the age of 14 or dogs are allowed. 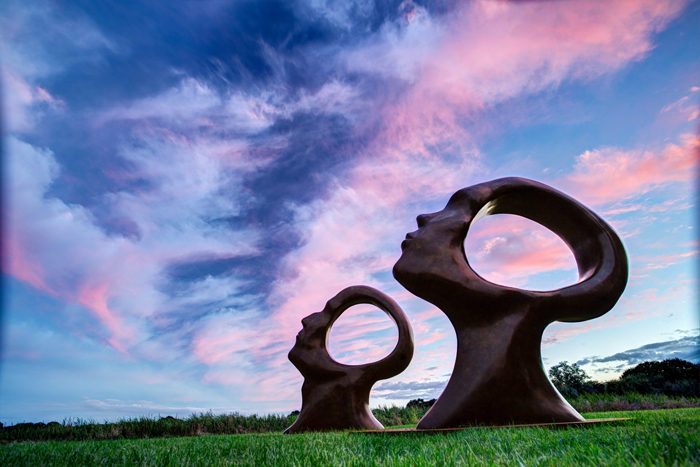 Photo credits: All photographs are strictly © of The Sculpture Park. Pictured banner; ‘Isis’ by Simon Gudgeon.